I'm a confused collector. Whenever I travel, I always try to get a Souvenir Refrigerator Magnet, but I also get snow globes, keychains, T-shirts, mugs and whatever else I can afford. :p Well, so far, my ref magnet collection is the biggest one. Identify all 32 magnets! Click the photo to view full size. 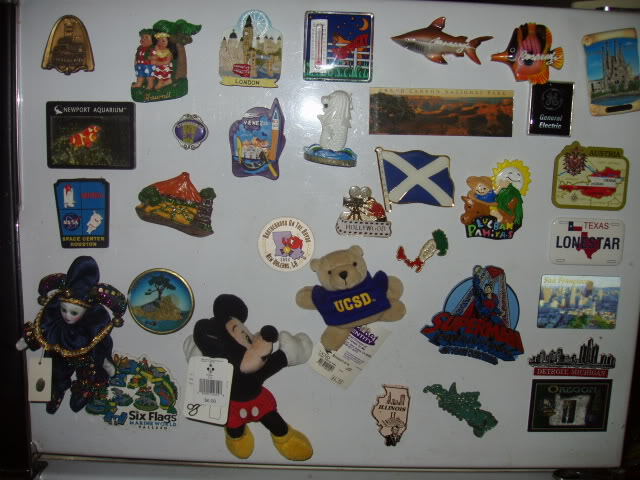 Name the Souvenir Magnets Contest! Let's make it a contest! There is only one requirement: Please describe what the magnets look like and then where it is from - then EMAIL your answers to listahan@gmail.com and leave a comment below to let me know that you joined! Whoever identifies the most (or all of the) magnets will be featured in my next blog post. (Lol, not much of a prize, but hey it's an uber EASY contest!). I will also give your logo with a link to your blog a 125x125 ad space on my sidebar for 1 month! :D woot! This mini contest will run from April 29 to May 15, 2010 only! nice contest very interesting,,, haha i can only name a few..
whoah! di naman masyado mahirap ano? I can probably guess a few. How will you choose your next President?